We have all heard about custom fitting for irons and it is very beneficial. Getting the length, lie, grip size and set make up correct for your swing can pay huge dividends. Therefore why do we occasionally find that a set of irons still does not work for us. Well Golfalot may have the answer and it is in the relatively new area of MOI set matching. Here’s the theory. Each club in the set has a Moment of Intertia (MOI) measurement defined in kilograms/cm². This defines the measure of a club's resistance to changes in its rotation rate. Each golfer will have a MOI measurement that best suits their swing. If a club matches this then the player will hit the ball out of the centre of the clubface more often, which increases distance and accuracy. Within any given set of irons most golfers will have an iron or two they hit better than the others and a couple they never hit well. This is because most sets are matched for swingweights, which is the relationship of the weight distribution between the head and grip ends of the club and is defined as D0, D1, D2 etc. Sets usually have an increment between clubs of 7 grams per head and a 0.5 inch in shaft length to keep swingweight consistent. However for a set to be MOI matched it needs a change in shaft length of 0.4 inches with normal heads, or an 8 gram increment in head weigth for the standard 0.5 inch difference in shaft. Therefore in most sets the MOI is different for every club and hence some clubs feel ‘easier’ to hit and others don’t. MOI matching finds the optimum MOI for you and then matches every iron in the set to that MOI. The swingweights through the set are then not matched but it does not matter as every club will feel the same when you hit it. To find out if this worked in practice, Golfalot went to see Ed Robertson at MOI specialists Applied Golf Technology at St Andrews Links Golf Academy in St Andrews. The first thing we did was to establish the correct MOI for my swing. 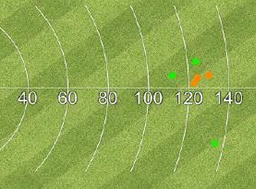 My 6-iron is usually one of my best clubs and Ed measure my distance and dispersion on the Trackman system with my current club. He then added 1, 2 and 3 layers of lead tape to the back of the club to increase the weight of the head and thus the MOI of the club. He also added a face sticker to measure the point of impact on the clubface. Using this and Trackman we were able to narrow this down to between 0 and 1 layers of lead tape being the best and eventually settled on half a layer of tape which provided the best combination for me of feel, distance and dispersion. The change was only 1 gram or about half a swingweight but the results were significantly better. Ed then measured the MOI of the 6-iron and then set about matching the rest of the set. I had always liked my 2-iron and not surprisingly that was the next closest club to my perfect MOI of 2732 kg/cm². My least consistent clubs were my short irons, with my wedge having the greatest difference of 20 kg/cm². Ed reckons a difference of /- 5 kg/cm² can be felt and he manages to fit clubs to /- 2 kg/cm², so a difference of 20 was significant. As a result Ed added weight to the 7-iron to Lob Wedge by putting tungsten powder down the bottom of the shaft of each club. The longer irons from 5 to 2 had to have weight reduced and this was achieved by sanding off a sixth of an inch from the length of the shaft. The results of the MOI fitting were nothing short of amazing. My wedge which had been a bête-noire was transformed into a different club. The best way to describe it is to look at the before and after pictures of the impact marks on the face. This change was repeated with every club in the set and even though the clubs felt heavier when you picked them up, they felt consistent when you swung them. Without doubt this is one of the biggest changes in golf club fitting and my set of clubs has been transformed. It is possible to ‘retro-MOI fit’ your existing set of clubs, but make sure you have already been fitted for length and lie first. The costs will be in the region of £15 per club. Alternatively a more accurate way of doing this is to order a custom fitted set through Applied Golf Technology who will not only do the length and lie fitting, but also measure the weight of the head and select the correct weight shaft and grip before assembly to ensure that the MOI is consistent through the set. Not only is this a better way of doing it but is well worth the extra £100 or so per set as you will probably never need to replace the set of irons for lack of performance again. So the next time you feel like blaming your clubs, check out their MOI first – you may be right! Check out our features on driver custom fitting and putter custom fitting to see how the same principles have been adapted for them. The Swing DNA club will select the right shaft for you in 3 swings. Go behind the scenes to see how custom fitted irons are created. Tiger, Rory, Lee, Ernie and Phil don't carry hybrids, so why should better players? Teaser photos and video of the new Mizuno MP-54 irons, due in September. First look at the latest Mizuno blade MP-4s irons, to be released later this year.